docMgt utilizes Microsoft’s ClickOnce installation architecture for a few features in the browser. These features include Scanning. Importing, Exporting among others. Each of these features do something different but they all share one thing – ClickOnce. Here is a Wiki article that explains ClickOnce. Essentially, ClickOnce provides a way to auto-install small programs that perform features that cannot be done (or are difficult to do) in the browser directly. If you are using Internet Explorer then ClickOnce should work with no issues. Since it is Microsoft’s technology it makes sense that they support it. However, if you are using Chrome or Firefox you will need to add a browser extension in order to enable ClickOnce support. If you see a screen like this then you will need to install the extension. 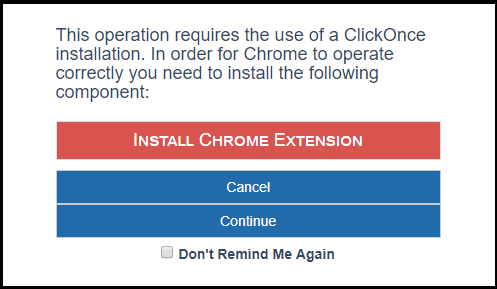 Once you install the extension you will want to click the “Don’t Remind Me Again” option. Without that then every time you click a link to activate that feature you will get prompted to install. This does not mean it needs to be installed again. It just means that we do not know that you have it installed so will continue to ask. To let us know that you have it installed, click the checkbox and the prompt will not happen any more. A recent Chrome release has caused issues installing the extension. If you experience a “Network Error” when downloading the extension please follow these steps. Download and install the extension then you can reverse the above changes. If experience any other issues with the extension please contact support. Remember to come back often for a new Support Line version article.